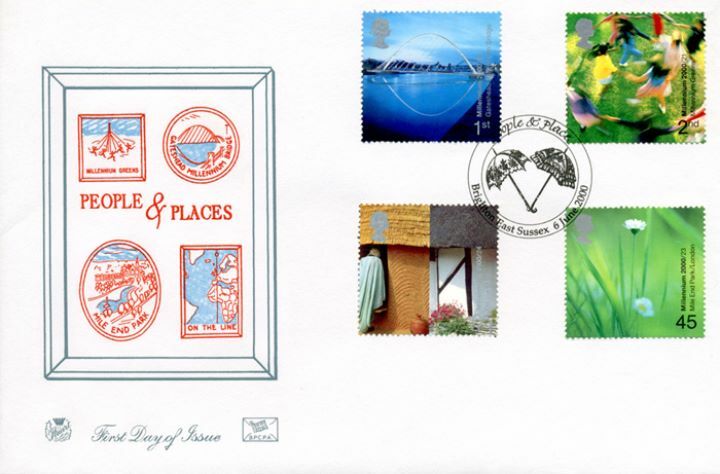 The above Royal Mail People & Place stamps were issued on 06 June 2000 by Royal Mail and feature the following stamp designs: 2nd Millennium Greens; 1st Gateshead Bridge; 45p Mile End Park; 65p On the Line (Greenwich). The Millenium Cover No. 6) first day cover with the Brighton, Umbrellas, Special Handstamp postmark has been produced by Stuart and features these stamps which can make a very collectible and lovely gift.